There are many methods to download YouTube videos on an Android phone . The easiest is by using Keepvid.com or any similar free video downloading services on the internet . But if you want to try a more straightforward and easier method to download videos from YouTube then you can try using a free android app . Tubemate is a free android app , using which you will be able to download YouTube videos to your android phone . Although the app is not available from the android app store . We can guarantee you that this handy little app is totally safe . Apparently it was once available from the Android app store , but as it was an app to download YouTube videos , it did not comply with Google’s policies and was removed from the Play store . You can download the Tubemate app from m.Tubemate.com . Visit the link on your Android phone to download and install the tubemate app . Once you have downloaded and installed the Tubemate app , follow the instructions below to download YouTube videos using the Tubemate app . 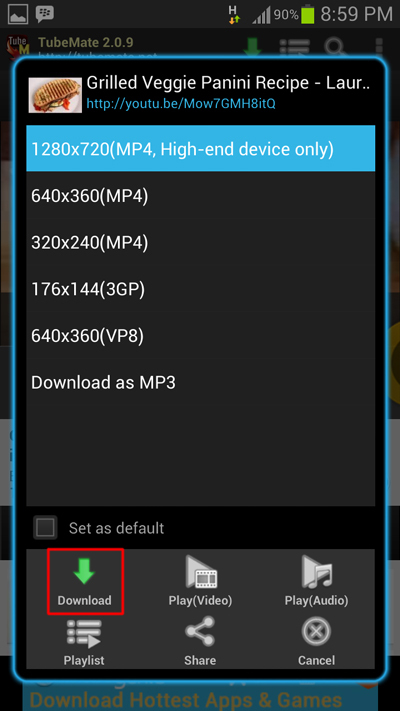 Apart from downloading YouTube videos this app can also download YouTube videos as a MP3 . Note: Downloading YouTube videos on your Android phone is not recommended while using a 2g / 3G / 4G data connection . Unless you are on a unlimited bandwidth internet plan , downloading YouTube videos will increase your data bill . Always try to use a WiFi connection to download YouTube videos using Tubemate . Step 1: Download and install the Tubemate app on your Android phone . 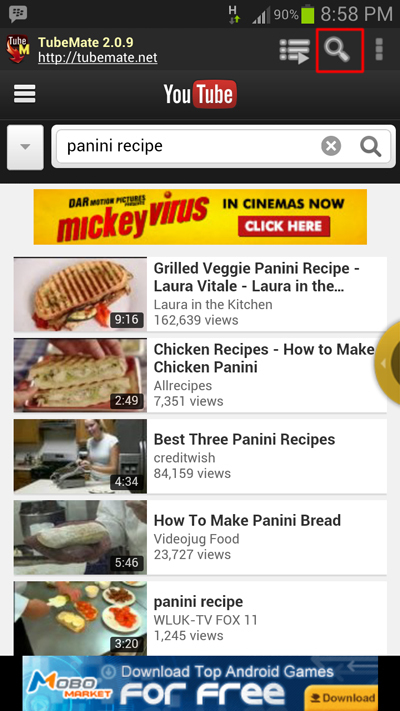 Step 2: In the app , tap on the search icon and type in your desired videos name . Step 3: Once the videos are loaded in the app , tap on a video to play it . Step 4: Tap on the green download icon on the top right of the app to download the currently playing YouTube video . Step 5: Next you will be prompted to select from a list of video formats to download from . 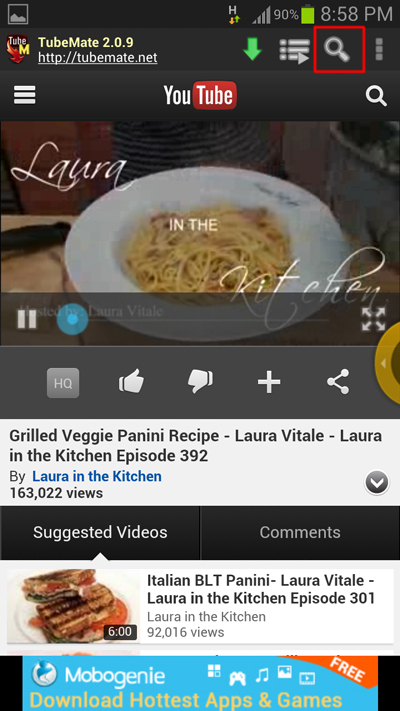 select a video format and tap on the download button to download the YouTube video on your Android phone . Step 6: Now the Tubemate app will start downloading the video in your phone’s background . The current progress of the video being downloaded can be accessed by expanding your Android phone’s notifications .